Boyd Cohoon – cowman, jailbird, knife fighter – cam home to Mad River. Waiting for him was a girl. As her father paid him to stay away, Cohoon saw the relief in her eyes. There was her brother, who had done the crime for which Cohoon had gone to prison. Cohoon saw the fear in his eyes. The mine owner who’d gotten rich off Cohoon’s land gave him a smile and slapped him on the back. Cohoon saw the deceit in his eyes. There was the sheriff. They had been boys together. Cohoon saw the suspicion in his eyes. So there was no home welcome for Boyd Cohoon. And Mad River saw the hatred in his eyes. Donald Hamilton is perhaps better known for his Malt Helm spy series than his westerns which is a shame going by the strengths of this twisting tale of secrets and revenge. The latter storyline adding mystery to this tale as Cohoon attempts to find out who really killed his father and brother whilst he was in prison, and why. There’s more mystery too as to the identity of ‘The General’ and who is feeding him information from inside the town. And then there’s the woman who rides into Mad River on the same stage as Cohoon, what’s her story? Character studies are excellent and dialogue snaps off the page with a hard edge. 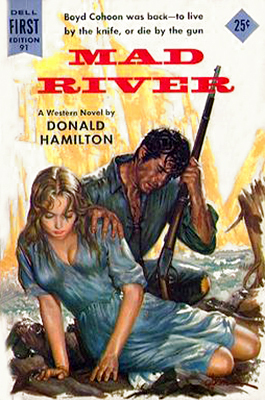 Action scenes are well described, particularly the ride down the river depicted on the cover shown. I really liked how Cohoon’s preferred weapon is a knife rather than a firearm making him a little different from the usual fast gun heroes of the majority of westerns. Ok, some of the plot twists are easy to predict but you can never be quite sure which direction the tale will take you next. Hamilton’s writing is strong and riveting making this a very difficult book not to read in one sitting. In my opinion Mad River is certainly a book worth tracking down. Like the first two excellent books in this series, this one also sees racial prejudices playing an important part in the story, something the author handles sensitively, yet still reflects the biases of the time the story is set without pulling any punches. GP Hutchinson has come up with a terrific set of characters and once the murdered Mexican girl is discovered the author manages to place an air of suspicion over the majority making me wonder as to just who did the killing and why. So, this novel is a murder mystery set in the West, yet it never loses the feel of being a western. The pacing is superb, as Strong has to deal with a series of set-backs and attempts on his life before the story reaches its shocking culmination. There’s plenty of brutal action and plot twists that made this a page-turner. You don’t have to have read the previous books to enjoy this one, as like the other two each stands well on its own. I do feel, though, that once you’ve read one of them you’ll be wanting to read the others. When the first book came out it was announced there would be two more. Now they have been published I hope it doesn’t mean we’ve seen the last of Emmett Strong as I for one would like to read more, so let’s hope GP Hutchinson has plans for another. 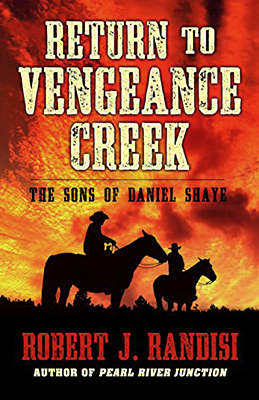 Career lawman Daniel Shaye has returned to the town of Vengeance Creek, Arizona with his two sons, Thomas and James, to take on the jobs of sheriff and deputies. Before long, they find themselves embroiled in cases of murder and revenge. When Red Fleming and his gang come to town to break brother, Harry Fleming, out of jail, they kill a jailer in the process. Since it was Thomas who arrested Harry, Sheriff Shaye sends his sons out to bring the Fleming brothers back. It’s the first time the Shaye brothers have gone on a manhunt without their father. Meanwhile Sheriff Daniel Shaye can’t leave town because Cole Doucette has been released from prison and is rumoured to be on his way to Vengeance Creek to gain revenge on the man who sent him to jail – Mayor Snow, formerly a district attorney. With the Shaye brothers trailing one gang, and their father, Daniel, waiting for another to arrive in town, the tension is high for the Shaye men, risking their lives to stand behind the symbol of the law they wear on their chests, the badge. In 2004, 2005 and 2006 HarperCollins published the first three Sons of Daniel Shaye books and now, through Five Star, Robert Randisi has brought the Shaye’s back. Having only read the first book I did wonder if it would have been beneficial to have read books two and three before starting this new story to fully comprehend their backstory, to understand their reasons for returning to Vengeance Creek. The answer is no, you don’t need to have read those earlier books to fully enjoy the fourth entry into the series as the author includes any information you need to know, and to be honest, that is very little, as this book stands on its own. 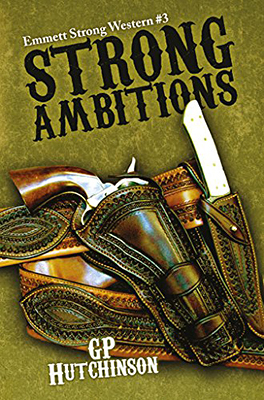 Many western readers will be aware that a lot of Robert Randisi’s novels fall into the adult western category but this book doesn’t delve into that area at all, meaning it is a book that all western fans can enjoy. The story is very fast moving and full of great characters, some of whom will have you wondering just what their role in this tale will be, Tate Kingdom for instance. In many ways this book is a combination of two tales, Daniel Shaye’s waiting game for Doucette and his men, and the story of his sons tracking down the Fleming brothers. Robert Randisi regularly switches from one set of characters to another, often leaving them in life or death situations, which will have you eager to keep reading. Deadly action erupts frequently and this sometimes happens off-screen so-to-speak, making you wonder just what the outcome has been, bringing tension to the tale as you share the emotions of those struggling to find out the answers. There are a number of surprises too, mainly to be found in the storyline revolving around Doucette’s return to Vengeance Creek. I found it very entertaining discovering the different ways Daniel Shaye goes about whittling Doucette’s gang down. I was also intrigued to find out why Doucette didn’t seem to mind losing his men, the answer to which I can’t reveal here. The book ends very satisfactorily and left me wondering if Robert Randisi will write a fifth book as I would definitely be wanting to read it. In the meantime, I’ll be digging out books two and three to get fully up to date on the adventures of Daniel Shaye and his sons.